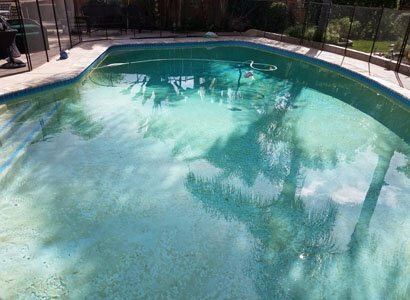 A Professional Pool Inspection By A Licensed Contractor is Important And Valuable! This Poway pool inspection with a written report was requested by the new home buyers. They were wanting this written pool inspection with a report of any pool repairs, safety or structural issues along with pricing to make necessary repairs. Luckily this new home pool inspection customer is getting this information from us, a licensed pool contractor. A company that actually knows what is going on and more importantly what it takes to get if fixed. Unfortunately, more new home buyers end up receiving a pool inspection by someone with little or no working knowledge of a swimming pool. A large percentage of home inspectors are now offering this service as they can charge a larger or additional fee regardless of knowing what they are doing. This is a swimming pool only and consists of White pool plaster, blue ceramic pool tile and a natural quartz deck and pool coping. Here is a breakdown of some of the important issues we found during this Poway pool inspection process. The pool coping and blue pool tile is in fairly good and structurally sound condition. The pool plaster, however, is another story. The plaster is in very poor condition due to excessive staining and plaster degradation due to what looks to be spot etching. 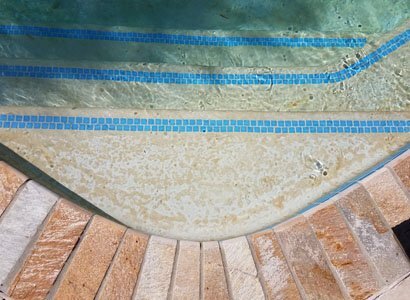 Spot etching happens due to conditioner levels in the pool water most likely introduced from the chlorine floater. this is a floating unit that holds multiple tablets, which was in the pool at the time of this pool inspection. There was a small area of pool decking and pool coping that were not the same level but, that is not very uncommon. Over time ground shifts and settles and may have happened early on in the pools life. 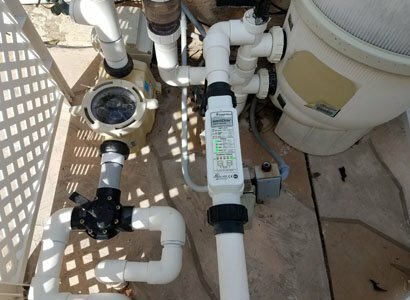 There was another big issue found and that was the in-floor pool cleaner at this Poway, CA home pool inspection was not getting suction. That can be as small as a clump of leaves clogging the vacuum line or even worse. If worse, a broken plumbing line or a much more aggressive clog that may be labor-intense and costly to repair. 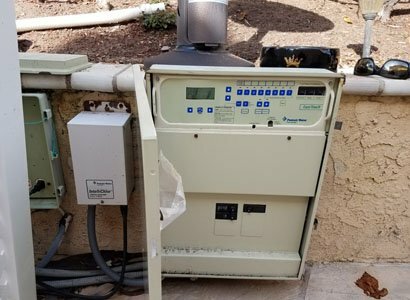 The pool equipment at this Poway pool inspection service was in fair condition. The pool pump is a variable speed Pentair pool pump that is energy efficient. The pool filter is also a Pentair FNS Plus D.E. pool filter. The salt system is a Pentair Intellichlo IC40 that is not in working condition. This Poway swimming pool has Pentair EasyTouch pool automation though it is not being used properly. There is an error reading that needs to have a pool repair diagnosis along with nothing on the pool controller is programmed. This Poway pool has pool automation though it is much more common with a swimming pool and spa combination. The pool equipment is not even tied into this pool controller. With a little bit of electrical repair and automation programming, this Poway home buyer can benefit from more money saved and better functioning of the swimming pool. Overall, There is a good bit of work that is needed to get this Poway swimming pool back into proper, safe, and functional condition. 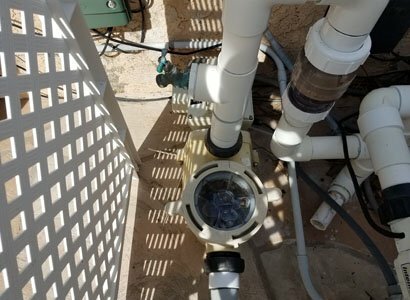 Due to what looks like the homeowner did the weekly pool service himself due to any professional pool service company would have seen these issues and made sure they were resolved. 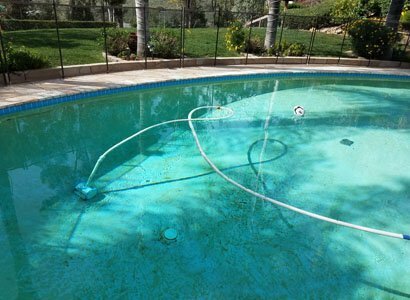 If you need a professional; pool inspection in Poway or any other part of San Diego county, we can help. Get in touch with us to schedule your next home pool inspection or ask any questions you may have. Kevin was very knowledgeable and addressed all of our concerns regarding the pool in the home we are buying. He explained the problems he found in detail and outlined our options going forward. We feel totally confident in our understanding of the state of the pool after speaking with him. As first time pool owners, we also had many questions about general pool maintenance, and Kevin what caring for our pool entailed, both on a high level and in detail. Kevin was a pleasure to work with- prompt, courteous and knowledgeable.